European jam tarts. Heard of them. Never had a taste of one. Have a lot of jam/jellies so I thought it was the right time to give it a whirl. I also had some almond paste, just a bit but it proved enough to make a touch of frangipane filling. I think you could leave out the frangipane part but why? It definitely adds to the flavor of the finished tart. Honestly it felt like I got it from a really high-end bakery. Gluten free too. Yes, I know of the famous British Bakewell Tart, this is sort of the reverse of that: with more of a tart and less of a cake result – next time I crave jam I may well try my hand at a Bakewell Tart. It is sort of like jam topped with a rich thin cake. Stay tuned! There are just a few simple steps to this; if you want the jam or jelly sweeter you can cook it down a bit with a half cup of sugar added. I did do that but honestly, I think it was not really necessary. Once it was thickened I put it in a new bowl and chilled it in my freezer as it was too darn hot! Extra work. Next time, just gonna stir up the jam and go with it. Make crust; chill. Stir up jam/jelly. Put the almond paste, sugar, extract, and flour in a food processor; mix until well blended. Sprinkle over crust. Glop on the jam and smear around with a large spoon or butter knife. Sprinkle with the sliced almonds. Bake at 375 degrees for about 40 minutes; until the crust is lightly browned. Cool at least an hour before slicing. Great with a dollop of whipped cream or plain yogurt. Stores for about 2 days (tightly covered) – if it lasts that long… Enjoy! Always on the lookout for a shelf stable gluten free snack choice… Saw this small bag of dark chocolate almonds at Walmart. Not generally where I shop for groceries…but there I was and there it was. On a shelf on the edge of the produce department, right next to dried fruit items. It was only like $1.29 for two ounces so I picked up one to try. It is just whole almonds dipped in dark chocolate. Made by Orchard Valley Harvest located in Illinois. 15 grams of sugar, 5 of dietary fiber, no sodium, 24 grams of fat. I didn’t gobble the whole thing; ate like 4-5 almonds at a sitting so I got at least 3 or 4 servings. I didn’t find it to raise my blood sugar much and I enjoyed the crunch of the almonds against the dark, almost bitter chocolate flavor. Delish and definitely worth getting again. Only wish it came in a bigger bag. Opps; while looking around for pictures I found that it does come in a 14 ounce size. Next time! FYI: I have been blogging for just over five years, first on Patch and then on WordPress. Recently I upgraded my blog to remove advertisements that WordPress puts up and to give me more storage space. Moving on up! I still enjoy the process of writing my blog posts and plan to continue for the foreseeable future. I write about new recipes I have made, new products I have tried out, restaurants I have eaten at or my struggle to find gluten free foods that are healthy and yummy. Occasionally I have to whine and vent about my life but mostly I am just so thankful to be healthier and to have good food for my meals. I am not much for pre-made foods so you will find many posts with recipes and not so many product reviews for readi-made entrees. I also try to cook and eat low sugar when it comes to dessert. I eat most produce seasonally and I eat a wide variety of veggies and fruits. Often my snack is a fruit; ;this afternoon I had a tiny tangerine and after work half a ripe pear. They are like my candy; sweet and juicy. I crave the fresh!! Thank you for tuning in and reading my posts on my gluten free life style. I enjoy writing, enjoy cooking and sure do enjoy eating tasty food. Most of my recipes are pretty easy. Before I went gf I ate a lot of snack bars and junk food. I have cut back severely on that stuff. My body feels better for eating healthy choices and that makes me feel better in general. Everything I post I have either cooked myself or eaten something I bought. No one pays me to post stuff, I am totally independent and honest about anything I report on here. I love good food; just hate eating crappy tasting so if I give you a recipe it is gonna taste great. Enjoy! Sometimes I find that it is just easier to make an ingredient yourself when you can’t easily locate it. Case in point the venerable item of almond paste, found in many old school baking projects. When I was a kid my mom used it to create marzipan fruit which she painted with delicate colors to resemble the real deal. These dainty tasty treats were displayed on a crystal plate and served to company. I was lucky to get one itsy bitsy peach which was gone in one small bite of deliciousness. Don’t ask me how a woman with seven children found time and energy to make marzipan fruit. Maybe because she didn’t have a computer or cell phone? Not my mom’s marzipan fruit but still lovely. Anyway, I wanted to make almond crescent cookies; had baked some last Christmas to much acclaim. Forgot to get the paste and I was kinda busy cooking up a storm, so I texted my sisters to get some. They brought almond filling, not the same, not even close. Bummer as we didn’t have time to shop again that day. I returned to the grocery store for the umpteenth time later this past week to get the right stuff and found no plain almond paste, only coconut or chocolate almond paste; weird. I bought some marzipan, thinking it would do. Nope. Not the same; too sweet for a replacement in my recipe. So I googled almond paste and came up with a recipe to make my own. Back to the store for plain almonds. I bought whole ones, they were out of blanched ones. 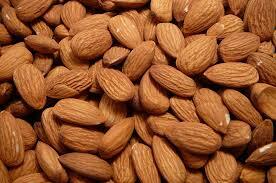 To blanch you heat a big saucepan half full of water to a boil; dump in the almonds and let them cook a couple minutes until they float. Skim off and lay on a rimmed baking sheet, let cool a bit and then peel the skins off, your nails come in handy for that part. That can take a few minutes, maybe do it while you watch a Christmas movie or special. Then bake those damp almonds on that rimmed cookie sheet at 170 degrees for 20 or 30 minutes to dry them out. Do not brown. Let cool completely before proceeding with the recipe. FYI: rimmed baking sheets are the best; they bake things more evenly with less burning than plain un-rimmed sheets. I found two old ones that are sturdy and with 1/3 inch rims, perfect. 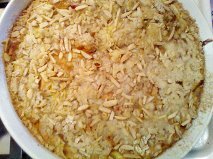 This recipe went together in just 5 minutes once I had the blanched almonds ready. It makes really great tasting almond paste; better than the redi-made stuff. Good to know, just in case you can’t find any at the store. FYI: I will post the almond crescent recipe but not today, one post at a time! This was a cool experience because I learned something. Before, I just took almond paste for granted; now I know that it isn’t too difficult to make my own and it is really yummy homemade! A bonus is that I got to use my ancient Hamilton Beach 2 speed processor, a faded refugee from the 1980’s. It seldom comes out to play except when I make a big batch of carrot soup as I have a mini one that is perfect for most blending jobs. This time it was the right size, got the job done and that is what counts! Place the whole blanched almonds and 1/2 cup of the powdered sugar in a large food processor (at least 7 cups in volume) fitted with a steel blade. Process the nuts and sugar until the nuts are very finely ground, stopping periodically to scrape the sides of the processor bowl. The sugar will help prevent the nuts from turning into almond butter, but done over process. Once the almonds are very finely ground, add the rest of the powdered sugar and blend until it is completely mixed into the ground almonds. Stop the processor and add the egg white and the almond extract. 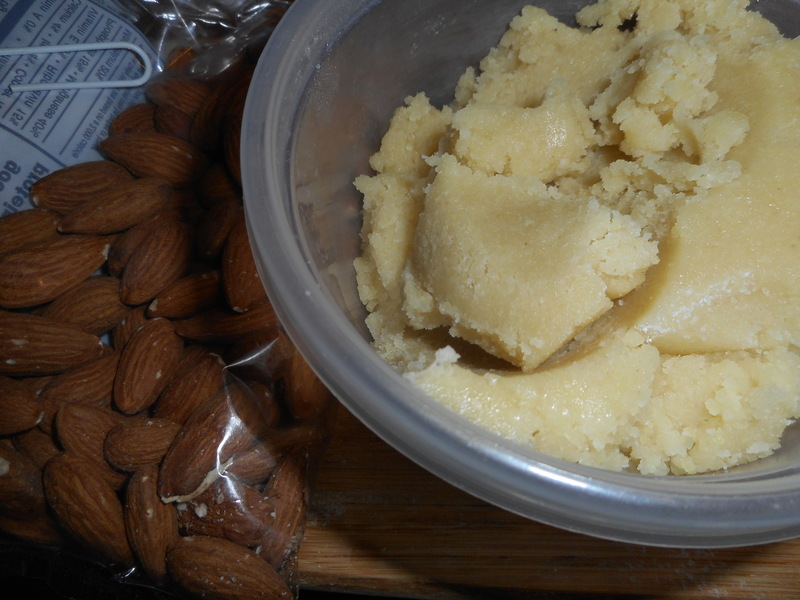 Turn the processor back on and process the almond paste until it comes together in a clump in the food processor. If it seems very sticky, add a little more powdered sugar, a spoonful at a time, until it is smooth. I didn’t need to do this. You can use the almond paste at once or wrap it to use at a later date. Wrap it tightly in plastic wrap and then store it in a zip-top bag. Wrapped this way, the almond paste can be kept for up to 3 months in the refrigerator or 6 months in the freezer. Make sure to bring the almond paste to room temperature before using it in recipes. PS: I forget exactly where I found this recipe, It is by Alton Brown, (my hero) just google almond paste and it should come up! Okay, this is my fall dessert Chopped (Food Network show)…. I have some ricotta cheese, some ripe apples, leftover crumb pie topping and a lemon. What to make?? I couldn’t find a recipe that suited those ingredients so I made up this tart. I used the cookie crust that I have been using since I went GF as it is really tasty and the crumb recipe I always use for crumb pies. I actually had the crumbs in the fridge so I didn’t have to make a batch of them. 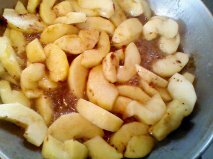 The apples are from my own Jonagold tree, any baking apple will do, Rome or Golden Delicious are varieties that come to mind. I would avoid eating varieties such as Red Delicious or Honey Crisp as well as those that stay very firm like Granny Smith. 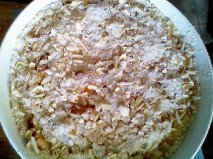 This tart is totally nummy good, the bottom is a crisp cookie crust covered with a thin layer of ricotta cheese custard under the caramelized apple slices and a topping full of crunchy almond goodness. I am guessing you could leave out the nuts or sub in walnut or pecans cut into small chunks. If you can’t eat oats you could certainly leave them out of the topping but I love the homey flavor and crunch they add. The lemon is an under flavor but it does add a really nice hint of lemon to the mix. I used some eggs I got from a friend who has her own chickens, the yolks were so orange they made the custard layer a lovely shade of gold. Nice. We had it plain but it is also fantastic with a scoop of vanilla ice cream. I served it slightly warm which was lovely but you will enjoy eating it at room temperature for sure. This tart has several steps in the construction of it but nothing too tricky. And it looks like it came from a fancy French bakery, yet it is totally gluten free. If you make this tart I promise you no one will even believe it is GF. They will just beg for seconds! Make your cookie crust and the crumb topping. 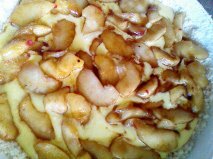 Then construct the apple filling and make the custard while your apples saute. Have all the parts ready before you put it together or you will be frazzled and your tart might be soggy. I did have to pick a few lemon pits out as I squeezed the juice right in with the apples. You can be smart and use a hand juicer! I have to say that this could be translated to a regular wheat all purpose flour based cookie crust of your choice with regular (wheat flour based) crumbs for the topping: for you wheat loving folks out there….if you want to enjoy this spectacular tart but don’t want to make it with gf ingredients. Add 5 tbsp cold butter, cut into 6-7 chunks. 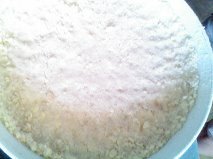 Mix on low until the butter is just crumbs blended in. Add 1 tsp. vanilla extract and 1 tbsp water. Blend well. Pour into a ten inch tart pan that was sprayed with cooking spray. Spread it up the sides ½ an inch. Press gently in so it is a cohesive crust but do not press really hard or it will be like concrete when you finish baking it! Peel and slice enough cooking apples to make 3 cups of apples. I used small ones, 5-6 but I am betting 3-4 good sized ones will suffice. If you have 3 1/2 cups even better! Melt 1 tbsp butter in a 9 or 10 inch frying pan, add ¼ cup packed light brown sugar, 2 tbsp. water and the apples. Sprinkle with 1 tbsp. fresh lemon juice. Cook 8 to 10 minutes until slightly soft. Sprinkle with ¼ tsp cinnamon. Allow to cool 5 minutes while you make the custard and the crumbs. You will use a heaping ½ cup of the crumbs. Put the rest in a tightly sealing glass container and store in the fridge for your next pie/tart. It should keep for several weeks. Just mix it well with a whisk in a small mixing bowl. If you don’t have smaller eggs use 1 large egg and an egg yolk as a good substitute. If you don’t like or have lemon extract just leave it out and it will still be awesome. Heat the oven to 400 degrees. Gently pour the custard into the crust. I tilted my pan a bit to get it to cover most of the bottom. It will not reach up the sides. I then carefully spooned the caramelized apple slices over the custard. Do not press them into the ricotta cheese custard. Try to spread them as evenly as possible so there are not huge gaps between apples. I spooned every bit of the caramel sauce on top spreading it around too. Sprinkle the tart with the streusel topping. Place in the oven and turn the heat down to 375 degrees. Bake 35 minutes or until lightly browned and a testing straw comes out clean. Cool at least 30 minutes. Serve warm or cold. Enjoy!